Fundamentally they are a technology company akin to the likes of Google but the availability of digital talent is a limitation due to its continued growth, as people with technical skills were in demand from other local and high profile employers. 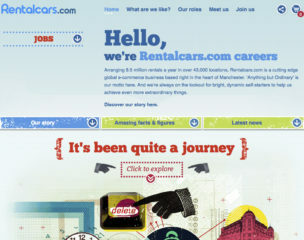 We needed to create an attractive recruitment platform that reflected rentalcars.com’s employer brand and made their opportunities stand out from the crowd. It needed to be one that would entice the right talent to join and help drive the business forward. Also, rentalcars.com’s distinctive culture needed to be communicated so that it reached those who would enjoy working in an environment that promoted independence and a metric driven performance. Combining our Art & Science philosophy we began with research within the business and externally. The research provided clear insight on which to build their brand; a key motivating factor for engaged employees was their ability to be different. From this insight we created an employer brand message; ‘Anything but ordinary’. 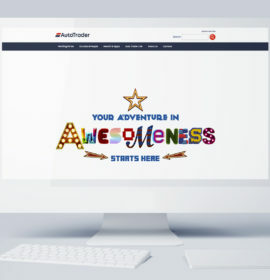 From this brand platform we created a destination careers website that would amplify this brand message through a great candidate experience. The user experience was personalised, based on job specifications serving relevant content which can then be shared through social media channels. The site was responsive and optimised for mobile devices. It also used a well-known feature of e-commerce websites – the basket, where relevant jobs were selected rather than products. The site retained the selections, allowing the candidate to find the relevant content at a later time. Another key feature was the integrated Google Hangout, an instant messaging and video chat platform which enabled the team at rentalcars.com to connect with potential candidates. The website was built on a content managed platform allowing the HR team to keep the site fresh with news and regular updates quickly and efficiently. The combination of the brand positioning work and the implementation of a great careers website has allowed rentalcars.com to begin its journey of building a distinctive reputation with both the local digital talent and that beyond our boundaries as a global business. This enables us to move from an agency recruitment model to a direct hiring approach, which now accounts for 80% of hiring.